Learn about the tools you'll use: angle and divining rods, pendulums, wands-even your own hands and body can be used as dowsing tools! 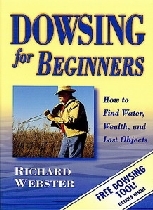 Explore basic and advanced dowsing techniques, beginning with methods for dowsing the terrain for water. Find how to dowse anywhere in the world without leaving your living room, with the technique of map dowsing.